Toyota has developed a new robotic personal assistant that can help the elderly or other people with limited mobility who may need an extra hand doing things around the house. The Toyota Human Support Robot (HSR) prototype is a one-armed robot that specializes in picking things up off the floor, retrieving objects from high locations, or opening curtains, according to the company. It performs these tasks by way of a 30.5-inch, single folding arm with a gripper on the end that also can suction thin objects from the floor or another surface. The HSR is relatively compact but extendable, measuring about 14.5 inches in diameter and with a height range of about 3 feet to nearly 5 feet. The 70.5-pound robot can hold objects weighing nearly 3 pounds or less and measuring about 5 inches across. It has a maximum speed of nearly 2 mph. 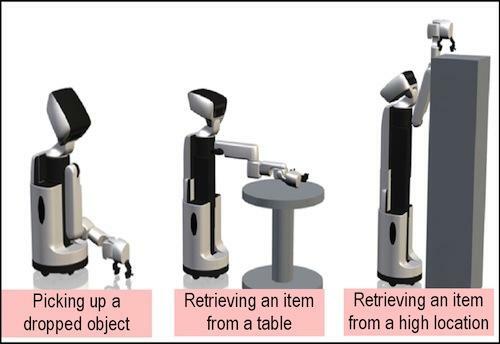 Toyota’s Human Support Robot is shown here picking up an object that’s been dropped, and retrieving objects from both a table and a high location. The robot, developed as part of the company’s Toyota Partner Robot series, is meant to help elderly people or those with limited arm or leg mobility perform everyday tasks more efficiently and easily in the home. Although the robot is mobile and can pick things up and make other autonomous moves with its arm, Toyota has designed it not to exert too much force, allowing it to be safely used in the home, the company said. A user or a user’s caregiver can control Toyota’s HSR via a tablet device or through voice commands. The robot also has a dock on its head for mounting the tablet so users can watch media or video chat with family members or other caregivers. The HSR prototype is part of the Toyota Partner Robot series, through which the company is designing and building robots to help assist people with everyday activities. It is designed especially for people with limited arm or leg mobility and was created in collaboration with Japan’s Service Dog Association, according to Toyota, which has already worked with the Foundation for Yokohama Rehabilitation Service to perform trials of the HSR in the homes of people with limb disabilities. Feedback from the trial was considered in the design of the prototype, the company said. Toyota’s latest prototype is part of a growing trend in the field of robotics to create robots that work safely alongside people, both at home and in a business setting, to perform everyday tasks more efficiently and easily. The CompanionAble project has also been demonstrating its own home robotic assistant, dubbed Hector, across Europe. Like Toyota’s HSR, Hector also can respond to voice commands and is controlled by a tablet device. It is aimed at helping elderly or disabled people in the home. Other robots are meant to make business activities more efficient. iRobot co-founder Rodney Brooks’ startup Rethink Robotics recently unveiled the sophisticated Baxter robot to work alongside people in a factory, while a creative chef in Beijing has spawned a new legion of robots to perform the mundane task of slicing noodles in restaurants — an assembly-line repetitive activity that can be tiring for human workers.